The stigma that your loved one has taken their own life can leave you feeling alone and isolated. You may find yourself in a struggle to survive and then move forward. Find hope in connecting with peers who understand. This seven-week workshop will focus on issues and experiences unique to suicide. Surviving After Suicide is a group for adults who have experienced the death of a loved one by suicide. This workshop is designed to provide members with information about the grieving process and to provide a safe, supportive, and non-judgmental space to share their experience and feelings with others who share a similar loss. 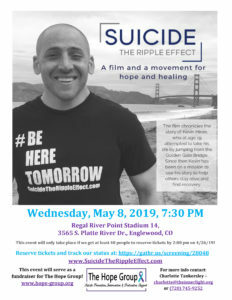 The next Surviving After Suicide workshop will be held Fridays, May 17th, 2019 – June 28th, 2019. The cost is $150 for the 7-week session and includes all course materials, activities, and light refreshments at each meeting. Registration is available here. Please contact instructor Charlotte Tankersley at charlotte@theinnerlight.org or (720) 745-9252 with any questions. This 2-hour workshop addresses some of the unanswered questions that are common after a suicide loss especially the “Whys?” and the “What ifs?”. We also explore the “If onlys…”, “Should haves…”, and “Could haves…” that often accompany a suicide death and the effects of unresolved guilt. Finally, we will learn some steps to take to help resolve the feelings of guilt that result from a suicide death. Celebrating and establishing new traditions at the holidays are often the last things you want to do, not to mention getting back to “normal” when it feels like your world is falling apart is something that feel nearly impossible after the loss of a loved one to suicide. Learn how to manage the holidays, deal with tender days such as anniversaries, birthdays and other days of remembrance, and find out what that “new normal” is and how to navigate it when it feels like it is so far out of reach in this 2-hour workshop. $25.00 registration fee includes a training booklet, wallet reference card, packet with local resources, certificate of attendance (if desired), light refreshments, and a digital copy of the book Suicide: The Forever Decision by Dr. Paul G. Quinnett, founder of the QPR Institute. Group rates available! Visit www.denverqprtraining.com for more information on this workshop or to register for the next training session.